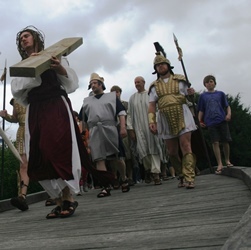 Every year the Frankston City Council hosts a dramatic, moving ceremony recreating the story of Easter. In a family-friendly environment complete with activities the entire family will enjoy, take a moment to walk in the footsteps of Jesus and reflect on the reason why we celebration Easter. This reverent recreation is not only for Christians. Easter eggs colour the supermarket shelves for months, tempting kids no doubt raising a few questions about why we celebrate with chocolate eggs on Easter Sunday. Everyone can come witness and participate in this interactive, inclusive spectacle, led by over 40 actors, to fully appreciate and understand the traditional story behind Easter. Held at the Frankston pier, the backdrop for this family festival is absolutely stunning. Kids will enjoy plenty of free activities including jumping castle and a petting zoo, then stay for something for lunch from one of the onsite food stalls or bring a picnic and feast on the beach. Good Friday on the Frankston Foreshore is being held on Friday 14th April 2017 starting at 11am and running through to 3pm. The Frankston pier is located on Pier Promenade, off Nepean Highway, Frankston. Entry is free and please note there is only limited onsite parking.